The Ball Aerospace JPSS-1 for NOAA and NASA is meeting all milestones for a 2017 launch. The satellite will assure continuity of the nation&apos;s future weather and storm forecasting and is the first satellite in the JPSS series of next generation satellites. Image Credit: Ball Aerospace & Technologies Corp.
Boulder, Colorado. December 3, 2013. Ball Aerospace & Technologies Corp. has achieved a pivotal milestone for assuring continuity of the nation’s future weather and storm forecasting by completing the primary bus structure of the first satellite in the Joint Polar Satellite System (JPSS-1). JPSS-1 is the follow-on in a series of next generation satellites and is scheduled for launch in early 2017. Procured by the National Oceanic and Atmospheric Administration (NOAA), through the National Aeronautics and Space Administration (NASA), JPSS-1 will continue the observations now provided by the Suomi National Polar-orbiting Partnership (Suomi NPP) satellite, also built by Ball and launched in 2011. The continuity these satellites provide on orbit is critical for ensuring the nation’s ability to accurately predict severe weather. 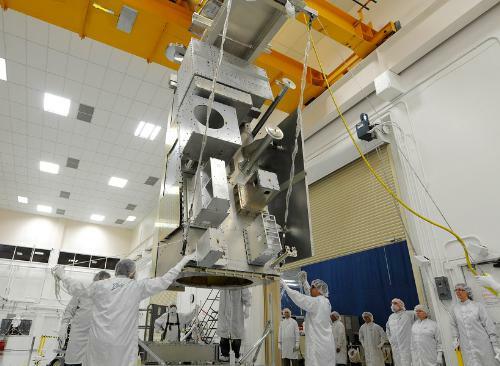 Ball is under contract to NASA’s Goddard Space Flight Center to design and build the JPSS-1 satellite bus, the Ozone Mapping and Profiler Suite (OMPS) instrument, integrate all instruments, and perform satellite-level testing and launch support.